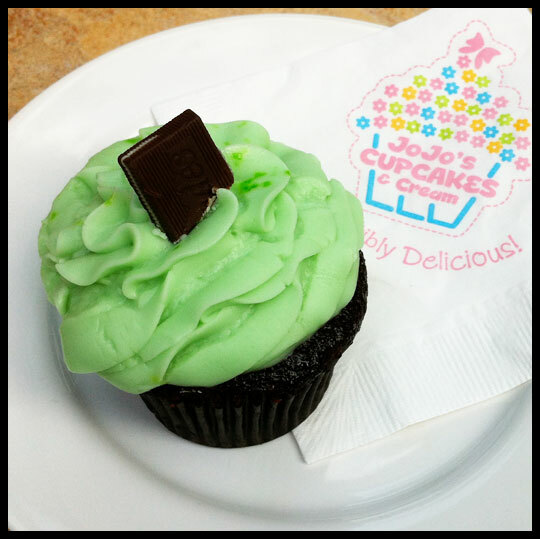 What’s a “Stay-cation” Without Cupcakes? Crusader Stacy recently took time off from work, spending part of her vacation in Florida, and then coming home early for a few days of R&R. Part of her “stay-cation” included spending the day with Leah and me. We had lunch, we talked, we shopped, we talked, and then we sat on the deck and talked some more. A perfect sister-day. 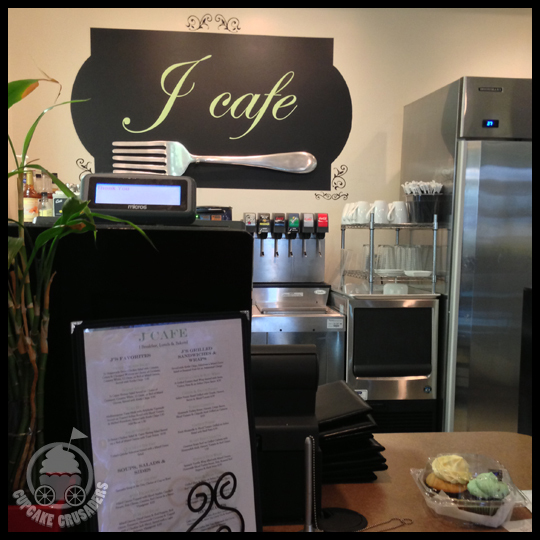 Instead of dining out, Stacy picked up lunch from J Café, in Westminster, MD. 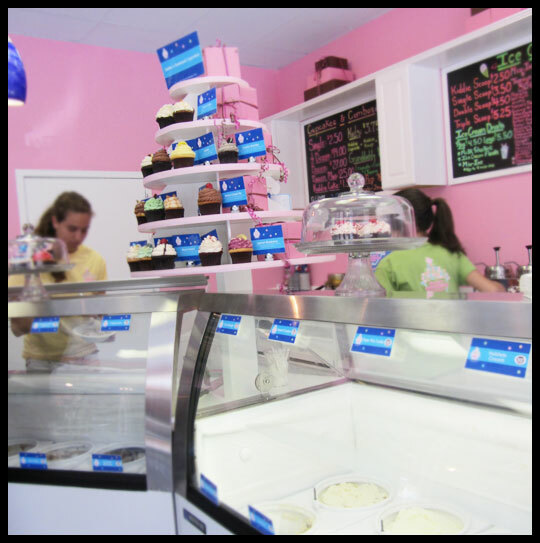 I’ve been there before, but only for the cupcakes. They have a quaint restaurant and very appealing lunch menu. Since our lunch was so good, I just have to share it. 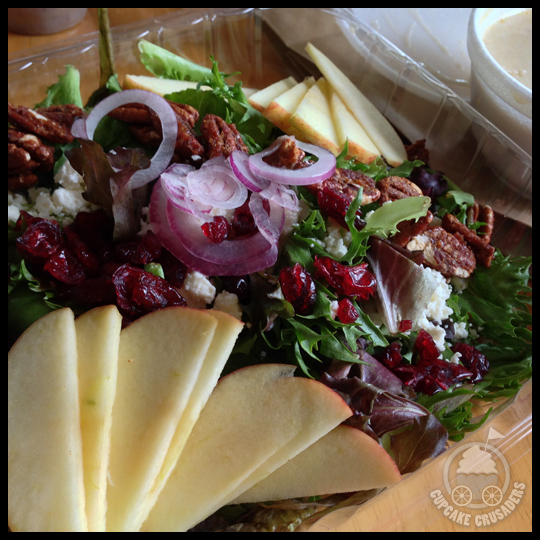 Stacy had the Apple Pecan Salad, which is mixed greens, topped with sliced apple, candied pecans, feta cheese, craisins, red onion, and a sweet vinaigrette. From the looks of it, she thoroughly enjoyed every bite. 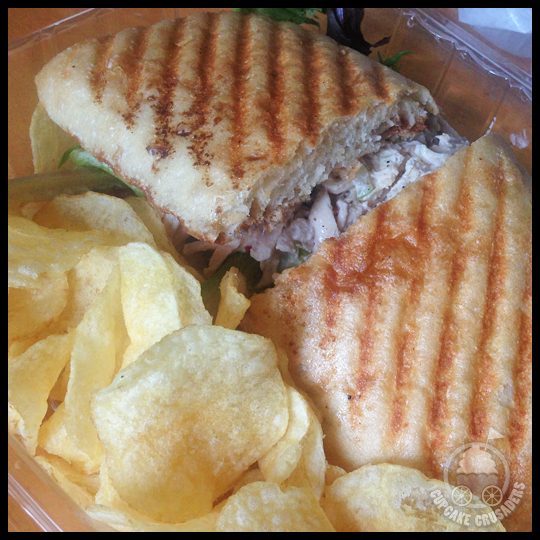 I was craving bread that afternoon, so I selected the Sweet Chicken Salad Sandwich. J Café was out of croissants (bummer!) but suggested their focaccia bread instead. The chicken salad was jazzed up with craisins, celery, and chopped walnuts, and was unlike any chicken salad I’ve had. Because of the bread selection, the sandwich was huge and I ate the whole thing. 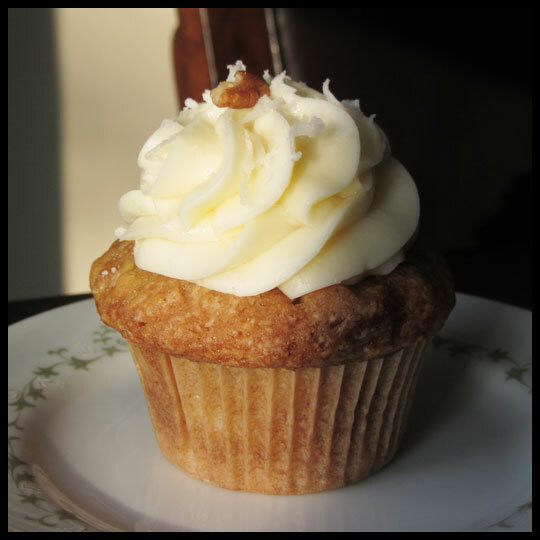 The craisins added a touch of sweetness, while the walnuts gave a great texture. Although it would have been nice to sit in their café, they packaged up the food nicely and it was still enjoyable, even as take-out. 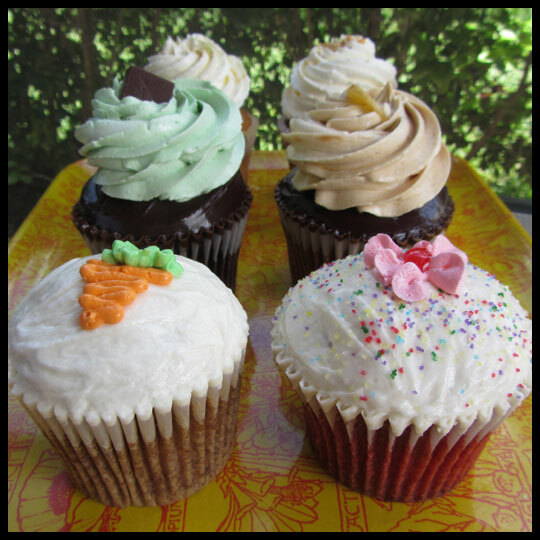 Now for what you all really want to hear more about…the cupcakes! 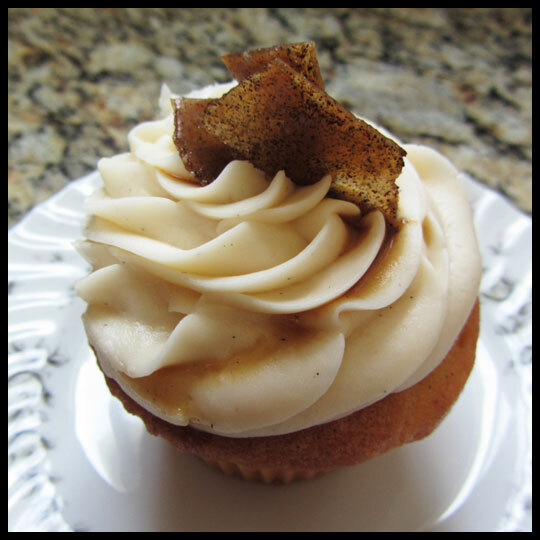 As I mentioned, I tried their Pumpkin Maple and Sweet Potato cupcakes last fall. 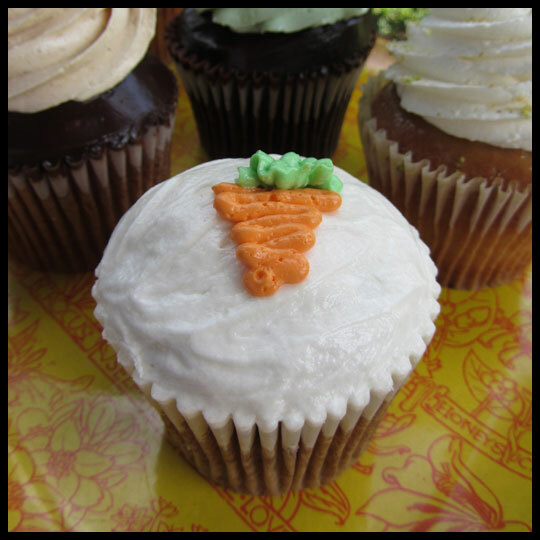 They were, hands-down, some of the best seasonal cupcakes I had last year. So, why did it take me so long to go back? My only answer really is, parking can be tricky in that area and I was busy eating a lot of other treats. So, it took Stacy going on a stay-cation to motivate us to give them another try. 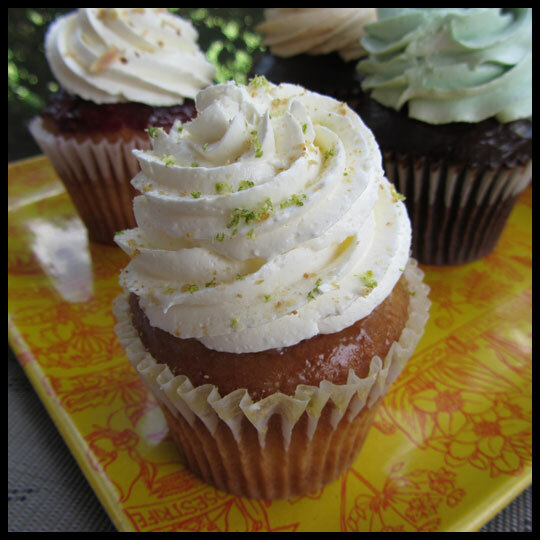 For my cupcake, I selected the Limoncello. With it nearing the end of summer, I’m getting my last fix of light, citrus/fruit flavors before I leave them behind for pumpkin and spice. 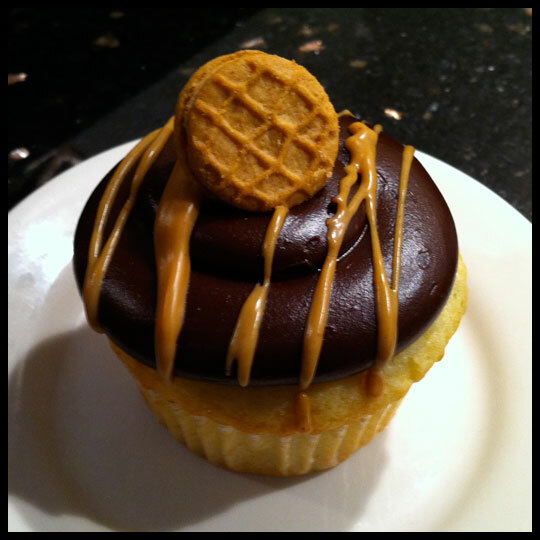 Sadly, I wasn’t as impressed with this cupcake as I’d been with the others. The cake was good, with a light, but fresh, lemon flavor. 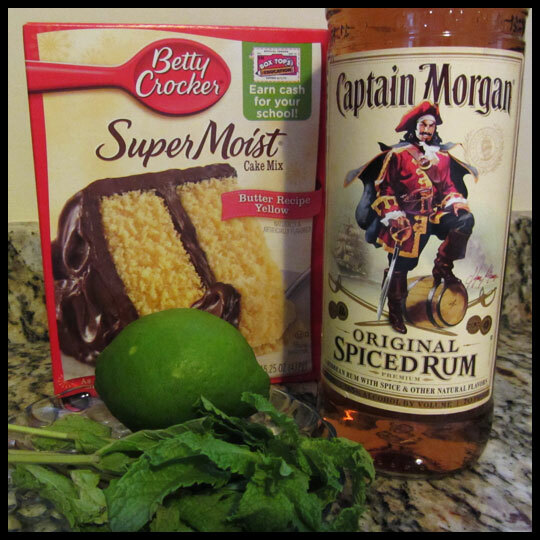 However the cake was dense and on the dry side and the lemon frosting didn’t seem as natural. 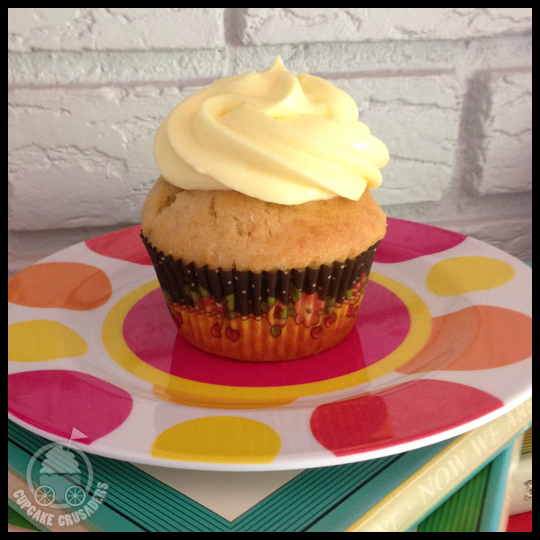 Perhaps they used Limoncello to flavor the frosting, but if so it resulted in tasting more like lemon extract. 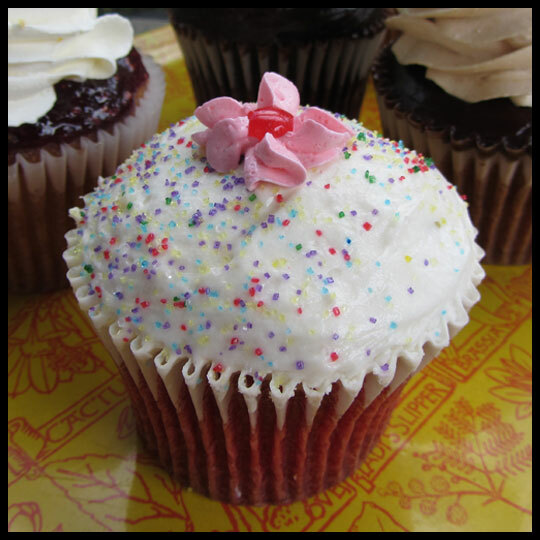 A redeeming quality was the smooth texture of the frosting and balanced sweetness as a whole. 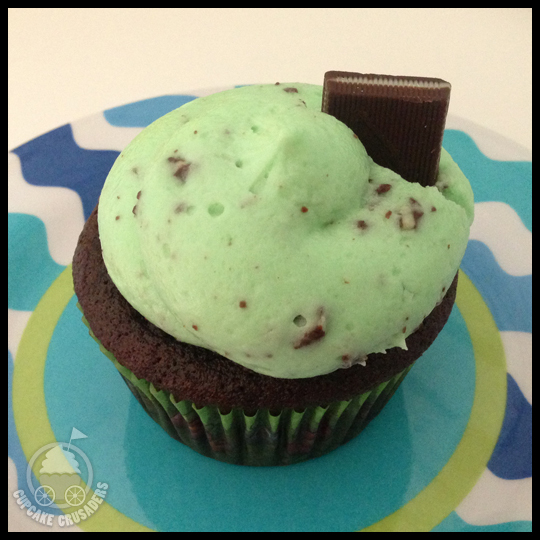 To offset her salad, Stacy chose a rich Andes Mint cupcake. 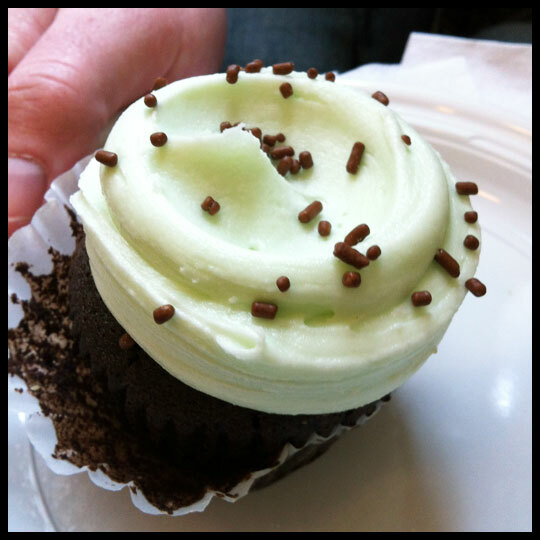 Stacy said that the cake was some of the best chocolate cake she’s had, moist with deep chocolate flavor, but the frosting was the star: not too sweet, perfect hints of mint, and small pieces of Andes Mints mixed throughout. 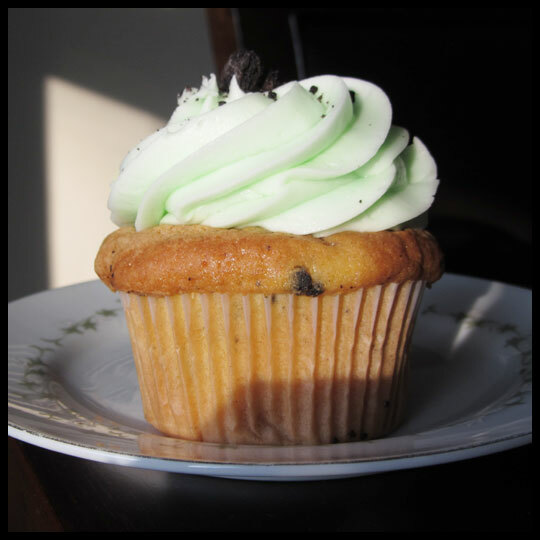 She said that it was the best cupcake she’s had in a long time! 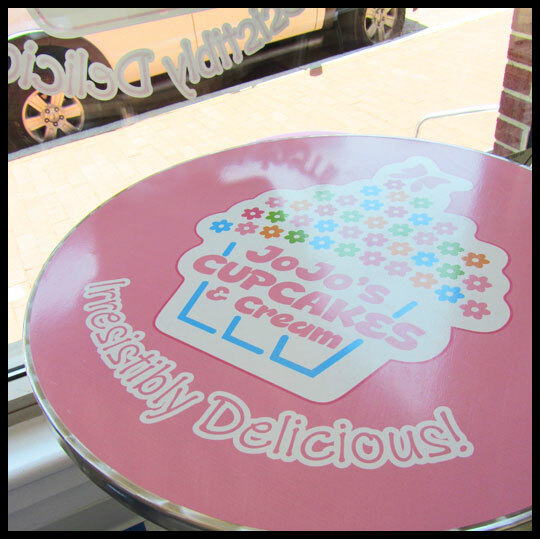 There will definitely be a next time for J Café, and hopefully it involves grabbing a table (instead of take-out) to enjoy their charming atmosphere while eating our cupcakes. We are excited to have another guest review from Jen. Jen is a close friend of the Crusaders (and a “name twin” to Crusader Jenn), currently living in New York City. 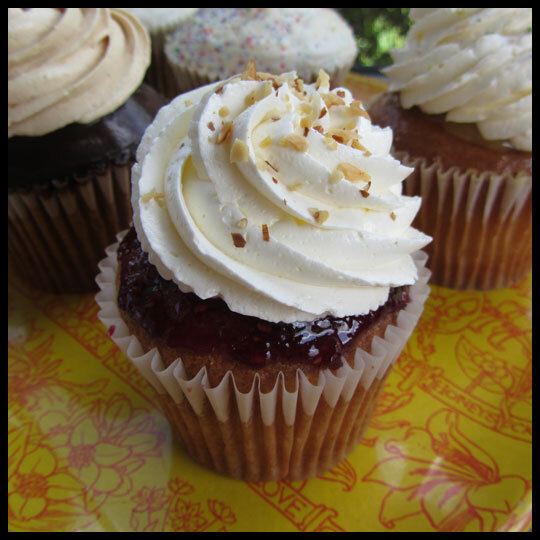 She’s been on many adventures with us and has taken the time to write today’s review on a cupcake tasting she attended at Billy’s Bakery! Thanks Jen! 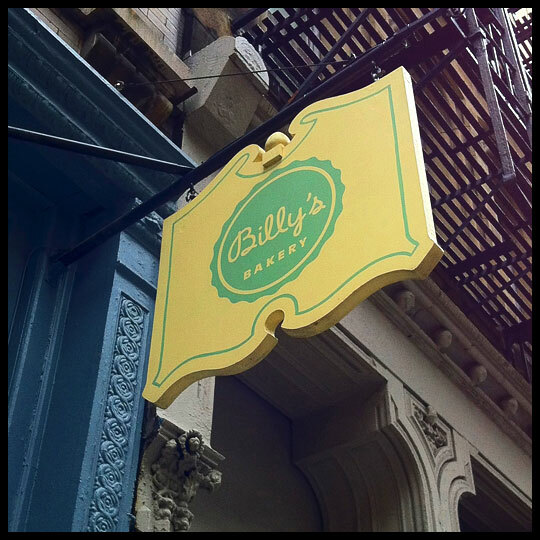 About a month ago, I was recruited by the Cupcake Crusaders to go to a meet-up at Billy’s Bakery in TriBeCa to try their new flavors. 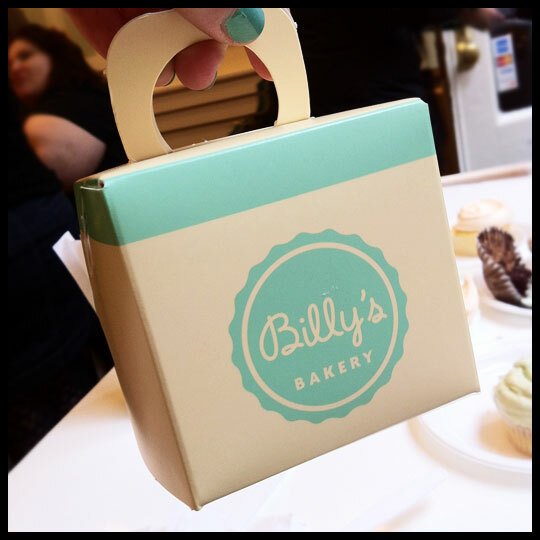 My husband tagged along, and together we tried all of the new flavors that Billy’s offers. 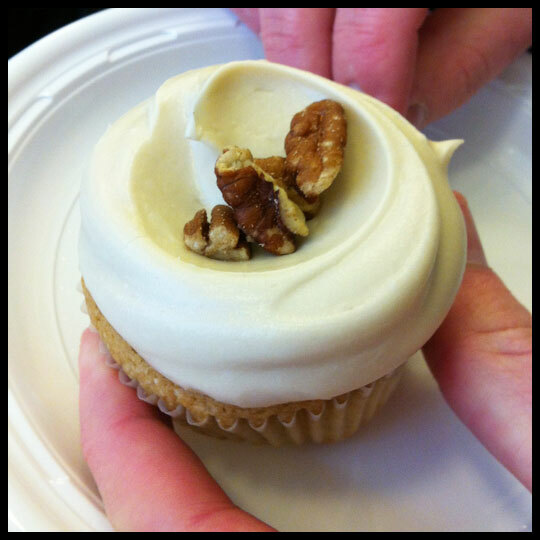 First up was the Maple Pecan. 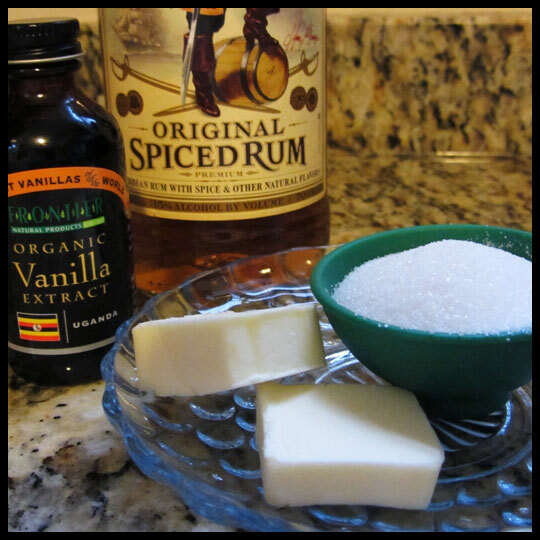 This was by far my husband’s favorite flavor, and he ate every bite of it! 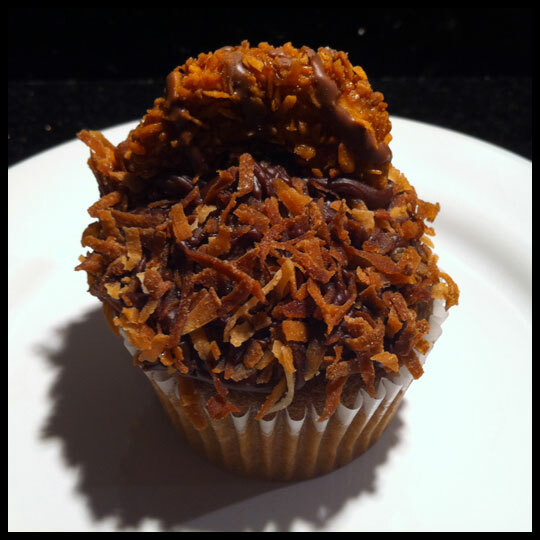 I did not try this one because I am not a fan of pecan, but I trust that it is delicious. 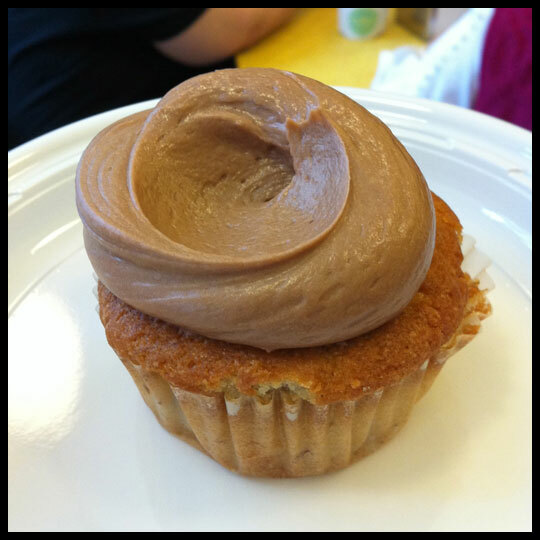 Next was the cupcake that I was most looking forward to – the Banana Nutella cupcake. I. Am. Obsessed. I didn’t want to fill up and not be able to try all of the flavors, so I ate half of this one and then at the end, I finished the rest. If fewer people had showed up to the meet-up, I would have taken a couple of these to go. They are really delicious. 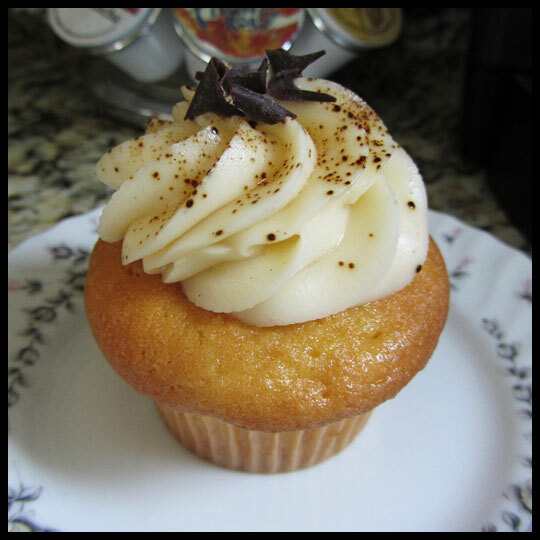 The frosting tastes like Nutella, but it’s nice and light and mixes perfectly with the banana cupcake. 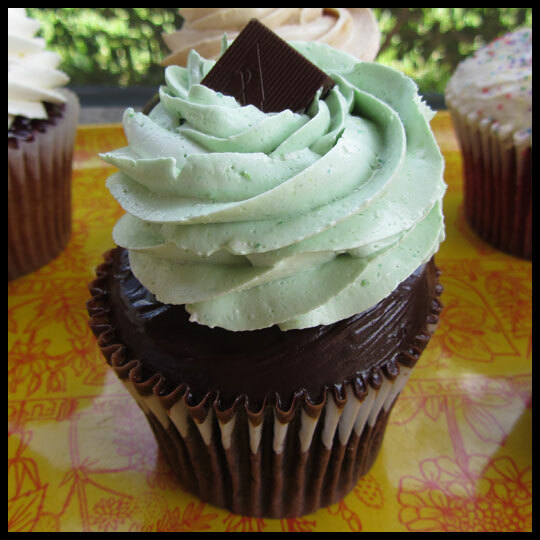 I had high expectations for the Mint Chocolate cupcake, because I have had some amazing ones at other bakeries, but honestly, this one kind of disappointed me. 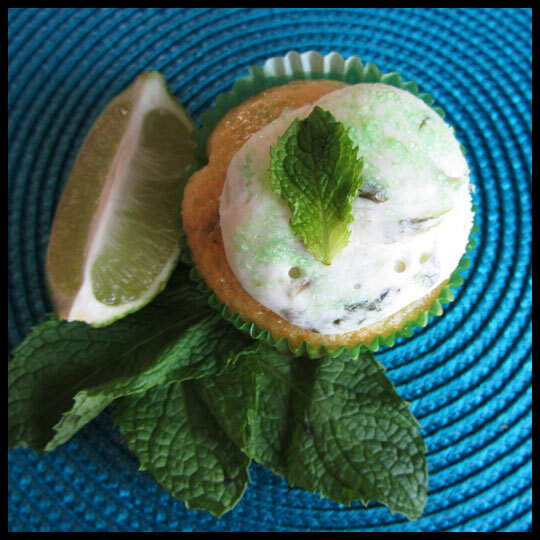 The balance of flavors wasn’t quite right for my taste (I can’t remember if it was too much mint or not enough) and it was also the driest of the cupcakes. 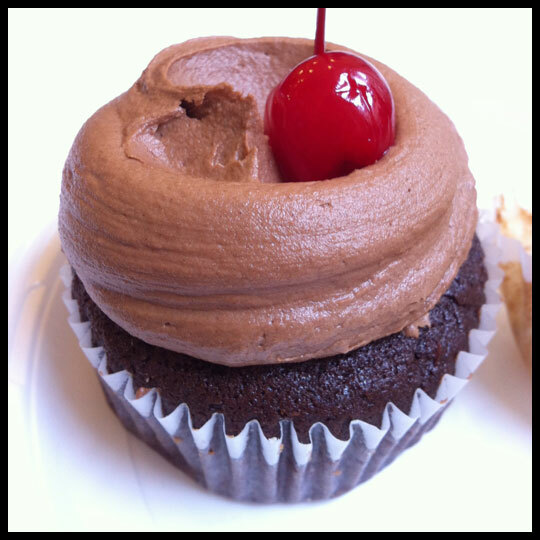 The Chocolate Cherry cupcake was pretty decent. 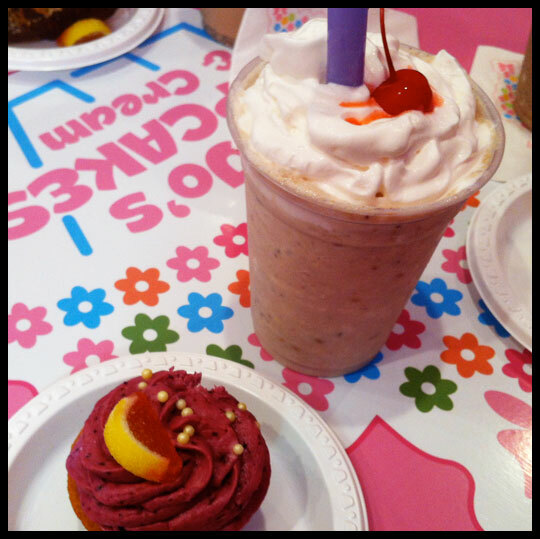 The cake was nice and moist and had little pieces of cherry in it. 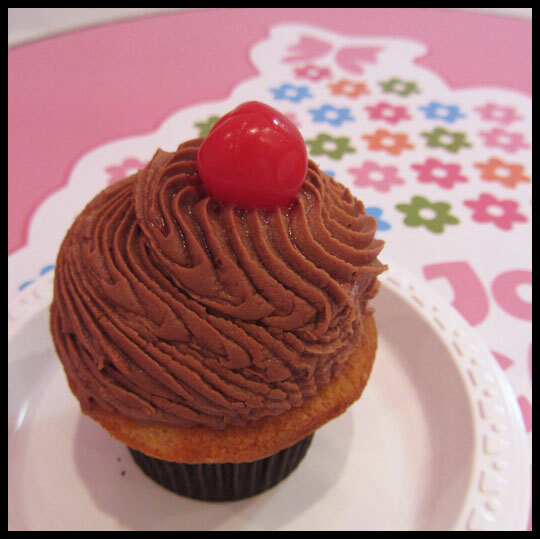 Normally I am not a fan of cherry things, but the chocolate made it pretty good. 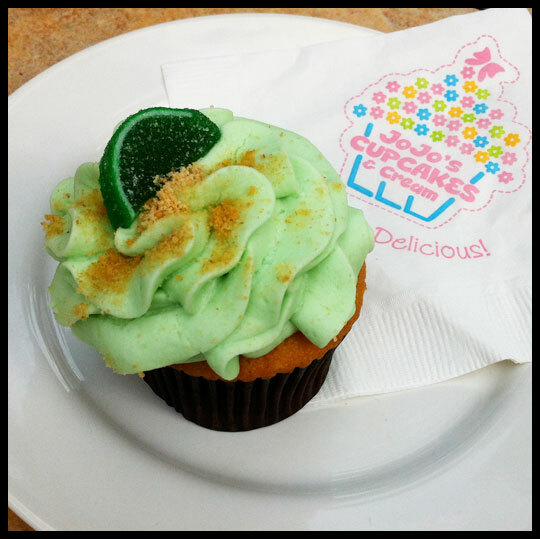 I was very curious when I heard that they had an Orange Dreamsicle cupcake. 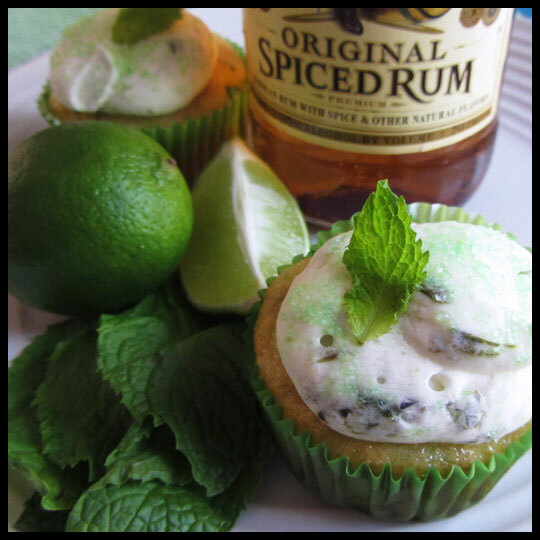 I have eaten both good and bad renditions of this classic flavor, but never in a cupcake. 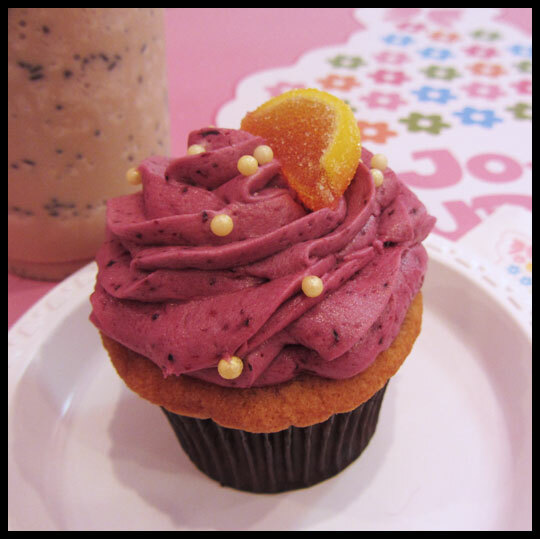 I really liked the cake, as the orange flavor was very light. 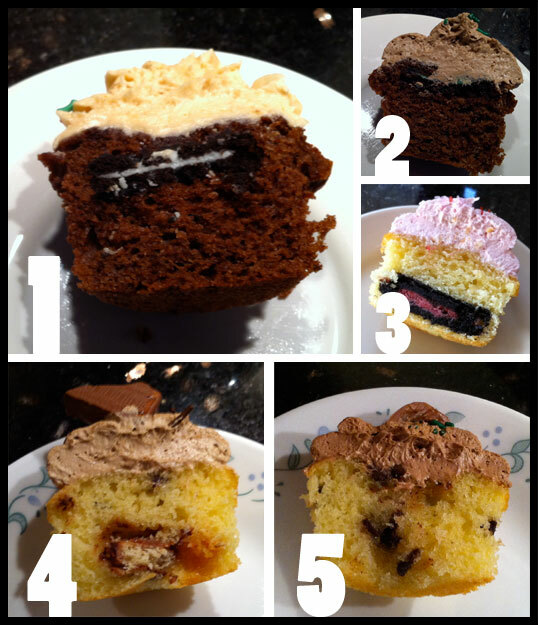 When I looked closely, I could see the tiny pieces of orange zest that are in both the cake and the frosting, and though I liked it in the cake, I did not like having little chunks in my frosting. 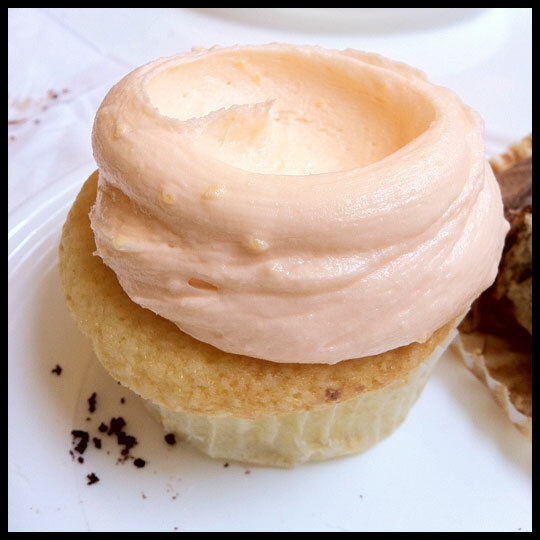 I wasn’t a huge fan of the Dreamsicle frosting because it was very sweet and the pieces of zest distracted me from the flavor. 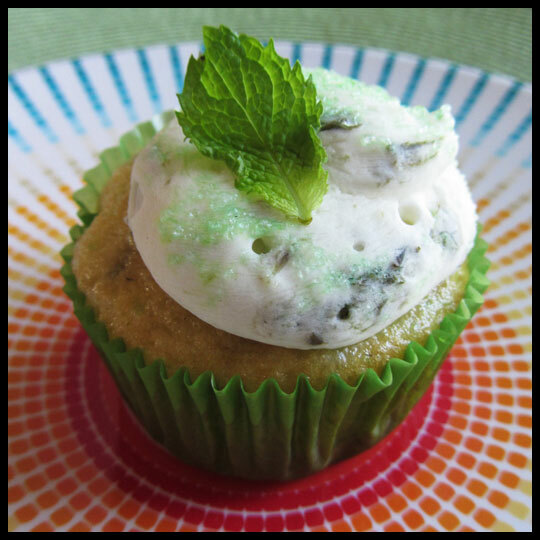 The other cupcake that I was really looking forward to was the Lemon Poppy Seed. 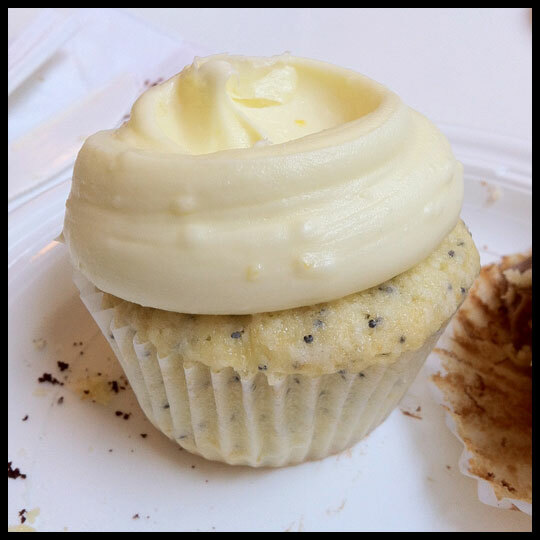 I had never had a lemon poppy seed cupcake before, and I was pleased with the flavor. 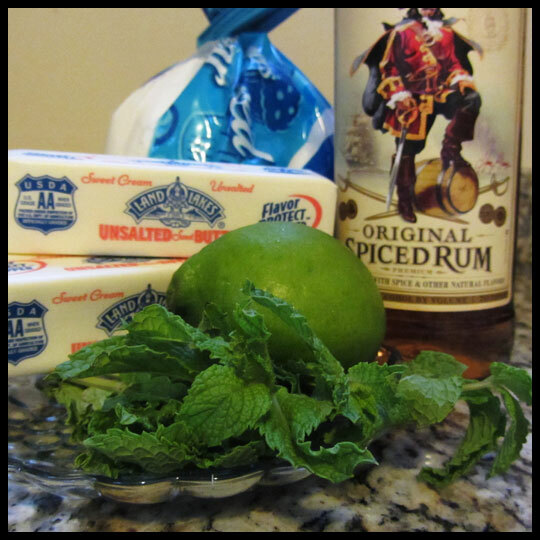 My husband did not really like this one because he is not a huge fan of lemon, but as a lemon lover, I thought it was very good. The cake was nice and light but still flavorful with a light lemon taste, and the frosting, though it had pieces of zest like the Orange Dreamsicle did, tasted really nice. 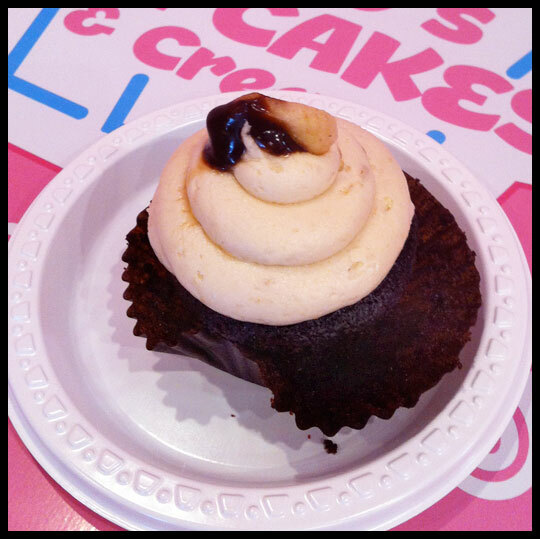 If not for the Banana Nutella cupcake, this would have been my favorite of the day. 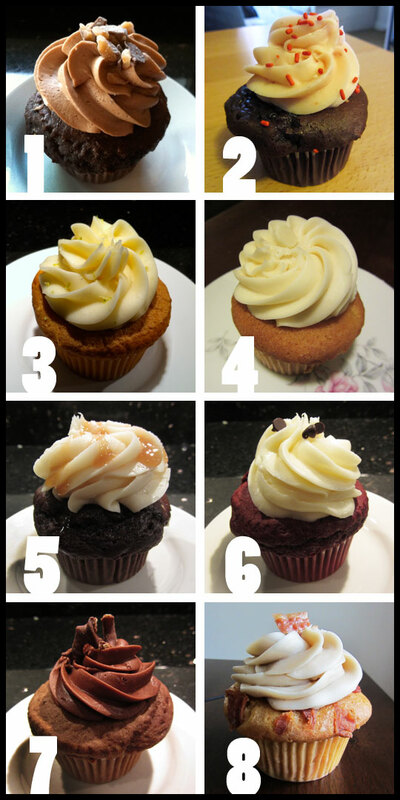 While I was not a huge fan of all of their cupcake flavors, I am a huge fan of their adorable branding and especially their single cupcake “take out” box! I saw a display of these when we first came in, and fell in love. 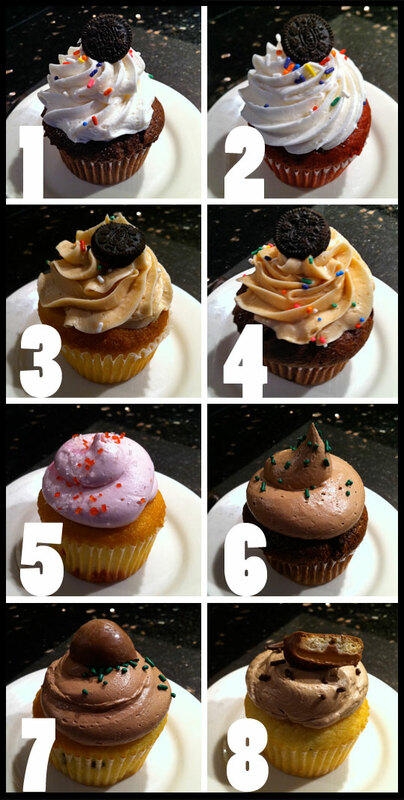 I have never seen a cupcake box with a handle, and really, that’s an extremely smart idea. I love the light yellow and teal color combo, and their vintage yet trendy typography works very well. 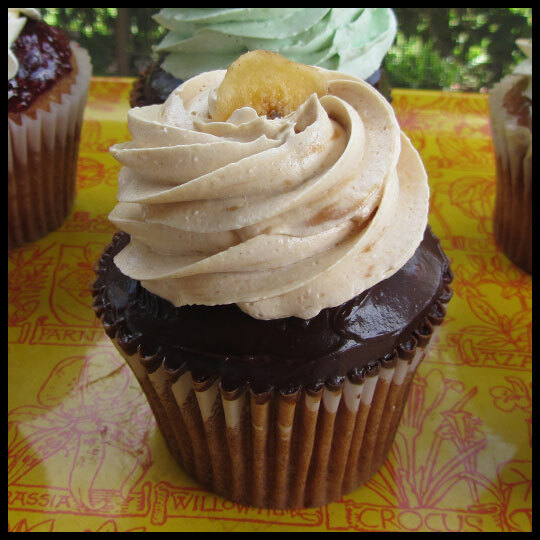 All in all, if it weren’t for the amazing Banana Nutella cupcake, I may not be itching to visit Billy’s Bakery again any time soon, but because it is one of the best cupcakes I’ve ever had, it may soon be time to make another visit!